Oceans have always played an ambiguous role in the life of maritime states. They mark the farthest boundaries of a country, but are also the gateway to the world - starting point for journeys of discovery, trade and connection with distant places. They can equally be a threat - a route for invaders and colonizers. People who live in coastal areas are marginal people. Occupying the extreme limits of the landmass, their eyes have always been turned seawards since a large proportion have made their livelihood from the sea, as fishing-people, sailors, harvesters of what is washed up on the shore, including, sometimes, the wreckage of vessels laden with treasures. Fisherfolk traditionally regard themselves as people of the sea. It is estimated by the Food and Agriculture Organization of the United Nations that the number of people worldwide dependent on fishing or fishing-related occupations is over 200 million. Fish has traditionally been a major source of protein for the poor. But over-fishing, industrialized trawling and growth in demand have raised the price of fish so that now it is increasingly beyond the reach of those for whom it was once a vital source of nourishment. 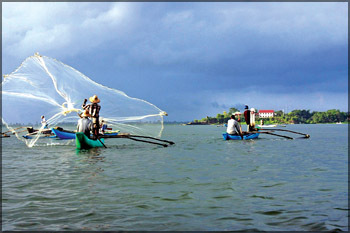 Fishing communities defy boundaries that countries have sought to extend from their lands into the oceans of the world. Fish, like birds, are indifferent to territorial (or marine or aerial) limits; and fishing people have regarded themselves as similarly free from such constraints. Their sphere of activity has encompassed the wide and open sea; they have culled the produce of the waters for centuries, if not millennia, and no one has interfered with their ability to roam wherever their fragile boats, currents and prevailing winds have taken them in search of a livelihood. Mobile and fluid as the element with which the fishing people work, these liberties are now being curtailed. And they, always in the precarious spaces between earth and water, now find themselves marginal in quite different ways. The first factor in this change is pressure on resources. The increase in mechanized fishing, the presence in fishing grounds of craft that can stay at sea for weeks at a time, with refrigeration plants on board and small-mesh nets that drag the seabed, have depleted fish stocks everywhere. The small fry - tomorrow's fish - are also caught in the relentless nets of big boats, and, unfit for consumption, go to make fertilizer or feedstock for fish-farms. These transform fishing from an activity that respects the natural resource-base into an extractive industry, creating 'marine products'. Secondly, its profitability has intensified the rate of fishing, which further diminishes the capacity of the oceans to replenish themselves naturally. There has been a systematic impoverishment of traditional fishing communities, those who operated within a day or night's journey from the shore. Many formerly self-reliant fishworkers now serve as labourers on the boats of others, or have left the coast to find refuge in the expanding and inhospitable slum communities of the cities of the interior. The second factor - one detailed with passion and clarity in 'Contested Coastlines: Fisherfolk, Nations and Borders in South Asia', a new book by Charu Gupta and Mukul Sharma - is the attempt by nation-states, particularly in south Asia, to enforce their jurisdiction over the seas that surround them. Perhaps because they feel the limits of their land to be uncertain - these were, after all, arbitrary lines drawn on the map of the subcontinent by former overlords - they feel they will gain stability by extending their control onto the waters. As a consequence, fishing-people are now at the mercy of the policing of seas over which they had sailed unhindered for generations. Those who have disregarded claims that the seas are extensions of territory, now find themselves, contrary to the provisions of the 1982 UN Convention on the Law of the Sea, arrested, imprisoned and mistreated by coast-guards, border security forces and maritime enforcers of their neighbours. The book contains scores of case-histories, including the memorable story of a man from Karnataka who spent 21 years in a Pakistani jail after being arrested for fishing in the troubled waters near the disputed Sir Creek channel. Pakistan, India, Bangladesh and Sri Lanka - all regularly capture people who have been merely pursuing an ancestral calling. Fishing people have been injured, killed or left to languish for years in foreign jails. Their families, destitute and without news of their loved ones, depend upon charity, loans and such work as women and children can find in impoverished coastal areas. Fishermen are turned into criminals by the enforcement of boundaries and limits they have never before been compelled to recognize. Not only this. They are used as what have been called 'prisoners of war' since whenever tension rises between two countries - notably between India and Pakistan - the number of captured fishing people increases. And when there is a relaxation in relations between them, exchange of captives regularly takes place. They are victims of a low-intensity conflict which exacerbates divisions between nations and nationalisms so all-encompassing that they seek to embrace the trackless oceans as well as the increasingly fortified borders that demarcate their territory. Both Sri Lanka - with its fear of terrorists emanating from Tamil Nadu - and Bangladesh, where every year the shifting coastline swallows up whole islands and spews out new strips of land from the sea - have apparently good reasons to halt the temporary short-term migrations of fishermen between their increasingly fortified territories. Fisherfolk traditionally regarded themselves not as nationals of this or that country, but as people of the sea; and this allowed them to co-exist with their fellow-workers from other countries, without dispute over what the sea yields. Sometimes groups worked side by side, catching different fish from the same site. Fishing people, with their easy mobility and ability to share the spaces between national entities, might have offered lessons in flexibility and survival. Instead, they are made to appear in the media as a symptom of the malaise of the contemporary world - as trespassers and encroachers, possessed of a restless, migratory spirit that scorns official demarcations and limits. It is a profound irony that Gupta's and Sharma's conclusions are that the governments of south Asia should formally recognize the fluidity and interdependence of coastal communities across boundaries. It is ironic because this would represent a restoration of what fishing people have always known - that attempts to confine the boundless sea are a delusion.